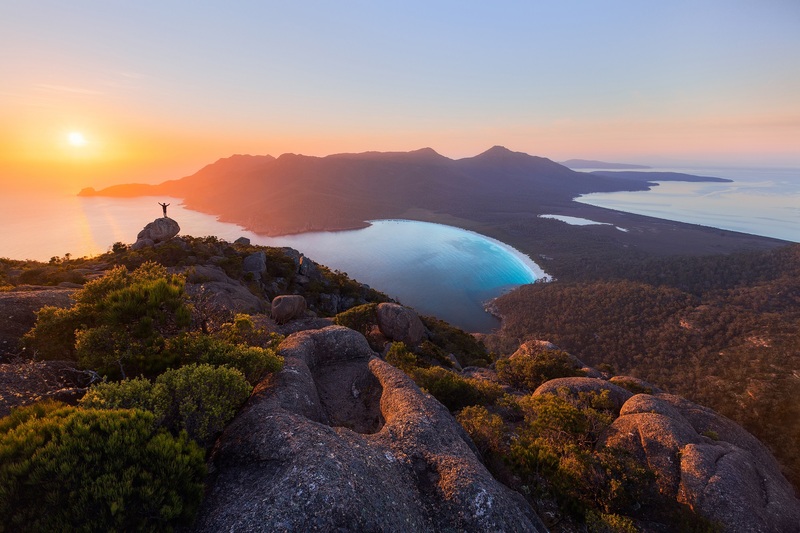 About 20 per cent of Tasmania is World Heritage Area. But not all of the green found in the state belongs to ancient forests. Travellers are also packing woods and irons for their adventures to Australia’s island state. With sweeping seaside links bordered by surf beaches – the emerald fairways and velvet greens of championship 18-hole courses – spectacular cliff-top holes with wide ocean views – these are just some of the experiences that bring keen golfers from around the world to follow their passion in Tasmania. Australia’s first round of golf was played near Hobart in the 1820s. Tasmanians now are spoiled for fairways and claim more courses per capita than anywhere else in the country. Today, the island has more than 80 golf courses, most run by clubs and a sprinkling of public courses too. No matter which fairway you tee off from, there will be a warm Tasmanian welcome waiting. Excellent 18-hole courses include the championship courses of Royal Hobart, Tasmania Golf Club, Kingston Beach and Claremont in the south, and Launceston Country Club, Devonport and Ulverstone in the north. Tasmania also offers some of the most spectacular golfing backdrops. The magnificent Barnbougle Dunes and Barnbougle Lost Farm at Bridport are both true seaside links courses in the authentic Scottish style and are widely acclaimed as two of the nation’s finest golfing experiences as are the more recently opened Cape Wickham and Ocean Dunes, both on King Island. Find layouts with scenic seaside greens on King Island and the Tasman Peninsula – get it wrong from the spectacular cliff top tee at the Tasman Club’s par-3 eighth at Storm Bay, near the Port Arthur convict settlement, and bid adieu to your ball as it disappears into a rock gorge then in to the ocean far below. At the Tasmania Club in Hobart, tee-off on the challenging third hole, modelled on the famous 18th at Pebble Beach. The Claremont Golf Course, on a scenic peninsula jutting into the River Derwent, has views of the river and Mt. Wellington from all nine holes. It’s not all about golf though. Tasmania’s rich soil, pure air and clean water, inspire dedicated growers to produce a truly authentic food and drink experience. You’ll find some of the freshest produce in the world here, at farmer’s markets and in local eateries, from cheap and cheerful pubs to high-end bars and restaurants. You can even stop and buy from roadside stalls – in Tasmania you’ll still find honesty boxes all around the state. Foodies can learn how to prepare amazing plates at cooking schools, pick fresh produce straight from the source and sample excellent dishes and produce at food festivals and master classes. Tasmania is also home to some of Australia’s leading cool climate wines with our pinot noir and sparkling wines attracting the interest of wine makers from around the world. The clean, green environment is also ideal for producing cider, whisky and gin. You’ll find boutique breweries and distilleries showcasing their wares at cellar doors all around the state, where you can sample the produce and talk to the maker.